Photo: Jason Merritt/FilmMagic via Getty Images. Graphic: Rebecca Fassola. De La Soul is one of the most culturally significant and musically influential hip-hop groups from the late ’80s and ’90s, but you wouldn’t know it from looking at the current digital realm of music that actually gets listened to. That’s because, by and large, De La Soul isn’t there. Thanks to a messy thicket of legal entanglements involving sample rights and intellectual property clearance questions, nothing before the band’s 2004 release The Grind Date and the 2016 Kickstarter-funded ...And The Anonymous Nobody are available on Spotify or other streaming sites. It’s not for lack of trying; the group has been fighting lawyers, lawsuits, and former label Warner Bros. for years to try and clear the way to post its music on digital platforms, to no avail. It’s supremely frustrating—mostly for the band, but also to the group’s legacy as rap pioneers and the legions of kids who can’t easily access this key element of the genre’s history, thereby threatening it. “We’re in the Library Of Congress, but we’re not on iTunes,” De La’s Kelvin Mercer, a.k.a. Posdnuos, vented to the New York Times two years ago, referencing the landmark record 3 Feet High And Rising—the first of their three-album collaboration with iconic producer Prince Paul that resulted in some of the greatest music of the era—which was entered into the historic Library Of Congress National Recording Registry in 2010. If one of the greatest rap albums of all time is limited to being purchased in hard copy when music’s digital existence looks like the future, will it endure? In short, De La Soul’s place in the pantheon of hip-hop greats should be a lot more assured than it is. Thanks to forces beyond its control steering the future of its discography’s digital availability, the act’s creative legacy is in danger of fading from view. (It’s one of the reasons De La Soul gave away all its music for free one day in 2014.) Luckily, YouTube and its many-headed hydra of licensing avoidance exists (we’re unable to create a Spotify playlist for you as a result of said legal issues). Consider this a primer on the group’s greatness: Take a listen, see what catches your ear, and go buy that album. De La Soul has more than earned it. “Whatever happened to the MC?” It’s the question that kicks off Stakes Is High, an album that not only began De La Soul’s first musical output without Prince Paul in the producer’s chair, but also redefined the group’s creative voice into something harder-edged, more willing to go to dark places lyrically and musically. There had always been mature themes and blunt poetry in De La’s arsenal (“I am Posdnuos / I be the new generation of slaves here to make paper to buy a record exec rakes,” they rapped on Buhloone Mindstate), but this was something new: a full-length meditation on the state of the hip-hop union, a concern for the commercialized decline of the art, and an indictment of the worrying elements of gangster rap. Plus, it all starts with this banger of a track. In a just world, we wouldn’t have to include this obvious of a track because it would be far too well-known, but since there’s a whole generation of younger folks who have likely never heard it (and those of us who have will never get tired of it), the first real song on 3 Feet High And Rising is also a great way to demonstrate just how fresh and original the group sounded in its debut. Funny, inventive, with inspired rhymes and innovative sampling to match anything on Paul’s Boutique, “The Magic Number” lit the fuse on the album and the artists who made it. Some slick spoken-word elements by writer and actor Bönz Malone aside, this is pure De La Soul at its catchiest. The title track from the group’s seventh record, it manages the feat of being an absolute banger while still making some salient points about the thorny connections between art and commercialization, one of the group’s most common recurring themes. Also, bonus points for managing to run a Yes sample through almost the entire song and have it never get old. With its third record, De La Soul was ready to press forward artistically to someplace more jazzy, more soulful, more experimental. In practice, this meant including tracks like the instrumental “I Be Blowin’” (with horn by Maceo Parker), guest appearances by Japanese rappers Scha Dara Parr and Takagi Kan (on “Long Island Wildin’”), and an ever more refined sense of groove that permeates the record, creating a greater cohesion than that found on the sprawling first two records. “Eye Patch” announces this new focus by getting in, delivering incredible verses and hooks (along with one of the best and shortest mid-song breakdowns ever at 1:29), a smooth outro, and getting out, all in two and a half minutes. One of the most thoughtful and evocative tracks from De La’s Art Official Intelligence records, “Held Down” takes a spiritual melody by CeeLo as its refrain and weds it to some profound thoughts on aging, fatherhood, and the difficulty of finding oneself in the modern world. Posdnuos has always been underappreciated as an unpredictable and inventive rapper, and here he delivers a genuinely affecting series of verses, culminating in an interaction with his child: “When I’m watchin’ the news, and my daughter walks in / And chooses to ask, ‘Why were all those people on the floor sleeping, covered in red?’ / I told her that they were looking for God, but found religion instead.” Heartfelt and moving, it’s an album highlight. And on the other end of the spectrum, we’ve got a party. An impressively arranged series of old-school samples of disco, Tower Of Power, and rock band Chicago come together to create a straight-up dance track that doubles as an ode to the roller-skating grooves of yesteryear. With appearances by Q-Tip and singer Vinia Mojica, this showcase for De La Soul’s ability to get a crowd moving is one of the rare moments of pure joy on the otherwise bleaker De La Soul Is Dead, as the group tried to shed its “hip-hop flower children” image. Mired in the nightmare of copyright-issue purgatory, when De La Soul turned to Kickstarter in early 2015 to raise money for a new album, it was determined to avoid the fate of its early records. 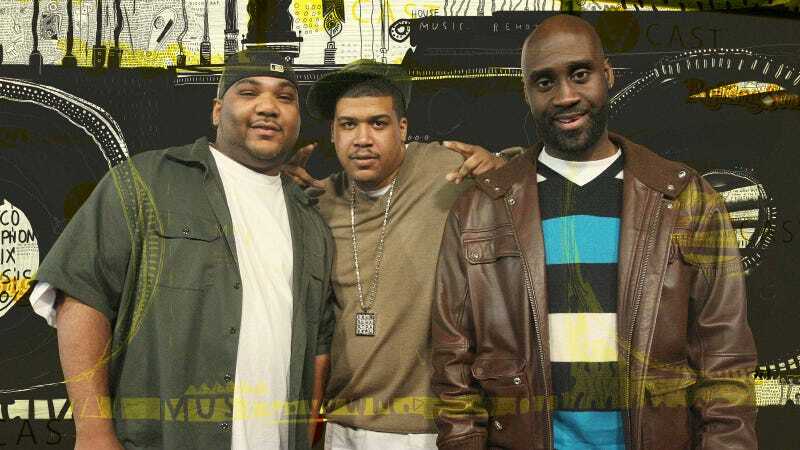 Instead, the trio turned to the Rhythm Roots Allstars, recording hundreds of hours of improvised music that it then whittled down to craft the backing tracks for ...And The Anonymous Nobody, released the following year to critical acclaim, De La Soul’s best Billboard chart debut ever (at #1, no less), and a Grammy nomination for Best Rap Album. With a seriously great guest verse from 2 Chainz, “Whoodeeni” operates on the level of sci-fi paranoia, its jittery beat and sonar-level bloops creating a sense of dread under a hypnotic groove. Sometimes, you just want to remind everyone of your lyrical skills. Art Official Intelligence: Mosaic Thump is more of a party record than anything, an “everything and the kitchen sink” release overflowing with guest appearances, oddball skits, and high-concept structure, but in its best moments it does little more than get down to the business of spitting rhymes over crisply conceived beats. “My Writes” includes some great verses from Tha Alkaholiks and Xzibit, but reserves its best moments for the De La crew, boasting on another level of slickness. “So pass the mic so I can put in my share / I rip it from home to L.A. / With connecting flights to rip it elsewhere,” Pos rhymes, and he’s barely begun. The song that really introduced the wider world to the Plugs, the first single from 3 Feet High And Rising to get an accompanying video with a decent budget was also the first (and only) track to hit number one on the U.S. R&B charts, as well as topping the Billboard Club Play chart. An infectious set of samples matches the wry, insightful lyrics about the group’s image, specifically targeting the erroneous “hippie rap” label affixed to them early on. But really, it’s just a great song, endlessly catchy and a classic example of Prince Paul’s influence on the trio’s sound. It wouldn’t be an accurate assessment of De La Soul if we didn’t include a skit. The properly maligned “comedy skit interlude” that has largely (and happily) died out in the rap genre was basically invented by the trio, which, along with Prince Paul, layered the between-song moments on its earlier records with a thick helping of its carefree sense of humor, cracked sensibilities, and sly cultural commentary. It may be an ignominious accolade in retrospect, but there’s a reason skits took hold. They were cheap, easy, and for the teenage market that obsessed over these records, they were like auditory crack cocaine. On 3 Feet High And Rising, they make for some silly and charming interludes between tracks, nowhere near the wheezy, exhausting bloat-monsters they would become. Part of what makes Buhloone Mindstate such an exhilarating listen is the way it manages to blend styles and techniques into a cohesive whole. Take “Breakadawn”: On first listen, it’s one of the most Tribe Called Quest-like tracks De La Soul ever recorded. Even Pos and Dave’s verses hearken back to the collective Native Tongues Posse sounds that spawned the respective groups (along with Black Sheep, Queen Latifah, and more), always friendly and ready with a guest verse for one another. But the alternating samples and third-verse reduction of the song to its barest boom-bap elements reveal a restless creative muse lurking behind the groove, and an artistic impulse to shake up even the most seemingly straightforward track. It’s got a very silly accompanying video (that repeatedly stops the music for comic interludes), but “Oooh.” is a straight-up party jam, one of De La’s best. With guest Redman acting as a warped master of ceremonies, exhorting the crowd to ever-increasing levels of participation, the bouncy and effervescent beat is bubblegum-simple, leaving the De La crew to dole out some of its more light-hearted lyrics in this ode to party time. It’s no coincidence this is one of the only times Prince Paul has resurfaced behind the producer’s seat, co-producing with De la Soul. It’s not a proper album per se, but in 2009 Nike approached De La Soul to create one of the sneaker company’s much-lauded workout mixes. The trio responded with an inspired burst of creativity, Are You In?—44 minutes of sonic exploration that largely eschew the jazzy grooves of the act’s earlier work, instead focusing on thumping beats and undulating electronic rhythms. The final segment of the single track, “Forever,” is an excellent example of where De La was at creatively, bringing in producer Young RJ to give it a free-floating, spacey tone, perfect for the closing minutes of a sweat-filled odyssey. The title track off the band’s blistering fourth album serves as a blueprint for where the art form of rap was in 1996. With production by the great J Dilla, one of De La’s finest collaborators, the group excoriates its small-minded contemporaries, with Dave’s scornful verse attacking Puffy-style excess (“I’m sick of talkin’ ’bout blunts, sick of Versace glasses”) feeling more like a call to arms than a verse on a thundering hip-hop track. It’s a rousing indictment of the flashy hollowness of mainstream hip-hop, and De La makes you feel every word. A magnificent, malevolent end to the group’s tightest record, “Rock Co.Kane Flow” features one of the most brilliant beat syncopations in the history of the form. Each verse slowly builds to a climax, as the beat builds behind the Plugs, slowly escalating and spiraling into a glitchy pummeling before dropping back into the groove. (And sometimes, just to mix it up, they slow down instead.) It’s fitting that MF Doom pops in for a guest appearance, as it’s an apocalyptic-sounding track, unlike anything they’ve done before or since. Once you hear it, you can’t forget it, and it makes for a fitting conclusion to this Power Hour.